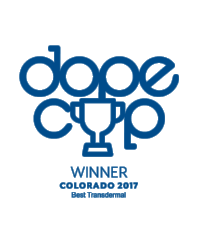 On August 20th, Evolve’s NanoSerum™ won the 2017 Dope Cup award from Dope Magazine for best transdermal. Dope Magazine is distributed in every dispensary in Colorado, Arizona, California, Oregon, Washington, and Nevada. This is a very respected award and past winners have done on to be dominate players in their categories. Product evaluations were completed by third-party company called Trichome Institute. Trichome conducted double-blind testing on Evolve’s serum to evaluate texture, scent, uniqueness, and packaging. We scored a 92.6 out of 100, one of the highest scores out of all categories. Trichome Institute said, “This is a fantastically packaged product that is clearly labeled with super simple dosing instructions. The pen is easy use and the gel was the perfect consistency and scent. Love it!” Trichome sets the highest standards of science, education, and certification in the cannabis industry. “Building a business and launching a product is already a big accomplishment, but to turn out a product that wins an award in such a short period of time is really amazing”, says Dave Tran, the owner of Dope Magazine. Winning such an accredited award in the cannabis industry is a huge deal. We are very proud of this accomplishment and expect many more awards in the future.